This works great. When is go to example: 127.0.0.1/test/pages/edit the index includes edit.php but in the index i use a css file named: test.css wich make the whole html background red. The reason this is happening is because the browser will guess what the URI-base is depending on the URL that's loaded. When you put http://127.0.0.1/test/ in the browser, the browser assumes the URI base is /test/ and all relative links will have that appended to the front. But when you put http://127.0.0.1/test/pages/edit in your browser, it assumes the base is /test/pages/ and thus your relative links get the wrong base appended to the front. The problem is that u did not give the proper path to the css. Always try to call style/script from base url as below: Hope this helps. Not the answer you're looking for? 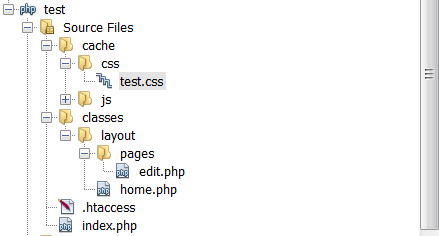 Browse other questions tagged php html css .htaccess xampp or ask your own question.